Directional instruments using sound waves (mechanical waves) are audio spotlight, ultrasonic heterodyning and LRAD; there is also the RADAR hearing effect. Remote Neural Monitoring and EEG cloning & heterodyning are mentioned in the discussion. Is it satellite technology? Reference to ionospheric heaters, therefore cannot be sure. Do you have to be chipped? No, everyone has a personal bioelectromagnetic signature. Health Phys. 2007 Jun;92(6):621-8. Review. Notes: The hearing apparatus commonly responds to airborne or bone-conducted acoustic or sound pressure waves in the audible frequency range. 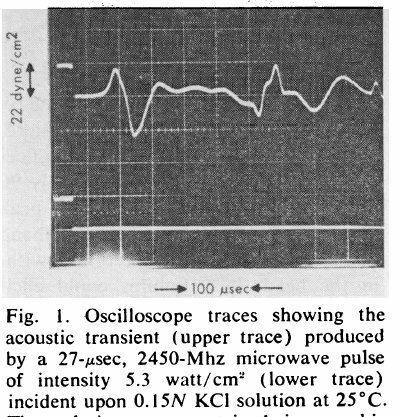 (…) the microwave pulse, upon absorption by soft tissues in the head, launches a thermoelastic wave of acoustic pressure that travels by bone conduction to the inner ear. There, it activates the cochlear receptors via the same process involved for normal hearing. Auditory response to pulsed radiofrequency energy. Notes: RF induced sounds involve perception, via bone conduction, of the thermally generated sound transients caused by the absorption of energy in RF pulses. By measuring acoustic pressure waves with a miniature hydrophone transducer implanted in the brains of rats, cats, and guinea pigs exposed to pulses of RF energy, Olsen and Lin  confirmed earlier theoretical predictions of pressure waves in the head. In later work, Lin et al. observed that the speed of RF induced pressure waves in the cat brain was similar to that of conventional acoustic wave propagation. These results support the thermoelastic expansion theory. The hypothesis of Foster and Finch  predicts that the RF hearing effect is related to thermoelastically induced mechanical vibrations in the head. Vibrations of this type can be produced by other means, such as by a laser pulse or by a pulsed piezoelectric crystal in contact with the skull which also induced cochlear microphonics in guinea pigs [Chou et al., 1976]. J Appl Physiol. 1962 Jul;17:689-92. No abstract available. Featured Patent: "Apparatus and method for remotely monitoring and altering brain waves"
Note by information-book.com: This is exactly what is happening to me; it is as if different personality patterns are imposed on me e.g. suddenly being clumsy, suddenly experiencing a different walking pattern etc. Also, I actually feel different people getting connected to my mind – It starts after I wake up when I suffer with head repetitive painful mechanical impact (and sometimes before actually waking up). On the possibility of human brain access by "electromagnetic induction of fundamental algorithms"
Note: I am a person who receives distant influences in the form of mind (and therefore body control). Regular manifestations include repetitive vibration or mechanical impact on head, head tightening, heart pacing (acceleration), vibrational currents on the surface of head etc. I am trying to understand the mechanism. Please refer to the studies mentioned at this site's page "Magnetotherapy"
"These results strongly indicate that imitation of the temporal pattern of sensory transmission directly within the brain by any nonbiogenic stimuli can evoke changes which are just as effective as (and perhaps require less energy than) classical transduction." What is consciousness based on the above? "Consciousness would be associated with an electromagnetic pattern generated by a neural aggregate with invariant statistical features which are independent of the cells contributing to each feature (John 1990, p. 53)." Why less energy than classical transduction? "If the temporal structure of the applied electromagnetic field contained detailed and biorelevant information (Richards, Persinger, & Koren, 1993), then the intensity of the field required to elicit a response could be several orders of magnitude below the values which have been previously found to elicit changes." "For example, Sandyk (1992) and Jacobson (1994) have found that complex magnetic fields with variable interstimulus pulse durations could evoke unprecedented changes in melatonin levels even with intensities within the nanoT range." "Above these minimal thresholds, the information content of the wave structure becomes essential. The simplest analogy would be the response of a complex neural network such as a human being to sonic energy. If only a 1000-Hz (sine wave) tone were presented, the intensity required to evoke a response could well exceed 90 db; in this instance the avoidant response would be overt and crude. However, if the structure of the sonic field was modified to exhibit the complex pattern which was equivalent to biorelevant information such as "help me, I am dying," field strengths several orders of magnitude weaker, e.g., 30 db, could be sufficient. This single, brief but information-rich stimulus would evoke a response which could recruit every major cognitive domain." each brain. For the first option, the steady-state or "permanent" component of the earth's magnetic field meets the criterion. The possibility that masses of susceptible people could be influenced during critical conditions by extremely small variations (less than 1%) of the steady-state amplitude (50,000 nT) of the earth's magnetic field such as during geomagnetic storms (50 to 500 nT) has been discussed elsewhere (Persinger, 1983). Recent experimental evidence which has shown a threshold in geomagnetic activity of about 20 nT to 30 nT for the report of vestibular experiences in human beings and the facilitation of limbic seizures in rodents is consistent with this hypothesis. However, the ratio of this normal range divided by the absolute temperature for normal brain activity which maintains neurocognitive processes is only about 0.013 (4[degrees]K/312[degrees]K) or 1.3%. If there were a subharmonic pattern in naturally occurring or technically generated magnetic fields which also reflected this ratio, then all brains which were operative within this temperature range could be affected by the harmonic. For example, if 11.3 Hz were one of these subharmonic electromagnetic frequencies, variations of only 1.3% of this mean, i.e., 11.3 Hz +/- [plus or minus] 0.1 Hz, would hypothetically be sufficient to affect the operations of all normal brains. If this "major carrier frequency" contained biorelevant information by being modulated in a meaningful way, then the effective intensities could well be within the natural range for background radiation (microwatts/cm2) and could be hidden as chaotic components within the electromagnetic noise associated with power generation and use." "The most probable brain source which might serve as the primary modulatory of these biochemical oscillators would involve structures within the thalamus (Steriade & Deschenes, 1984). Neuronal aggregates with surprisingly fixed (within 0.1-Hz) oscillations are found within this structure and depend primarily upon neurons that require gamma amino butyric acid or GABA (von Krosigk, Bal, & McCormick, 1993)." "The technology is called galvanic vestibular stimulation -- essentially, electricity messes with the delicate nerves inside the ear that help maintain balance."